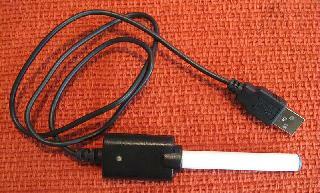 USB cigarette – Are you a smoker? Developed my Japanese, this electronic cigarette looks exactly the same like a normal cigarette. If you have heard about e-cigarette which runs on batteries, it's similar to that one. 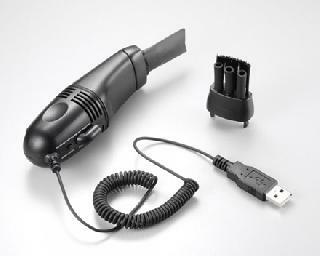 But with a difference that it is possible to charge this USB cigarette at any time from the laptop using the USB device. Corsair's Flash Survivor USB flash drive – it's like a usual memory stick with a small different. It can handle pretty much anything, keeping your data safe even if a car should run over it. Bookbook leather case for laptops for protecting your laptop from theft. The leather case looks a lot like an old book with a worn cover. Put your laptop inside it, close it and nobody will even get an idea of stealing your "old book". Washable laptop keyboard – want to work with your laptop while taking a bath? 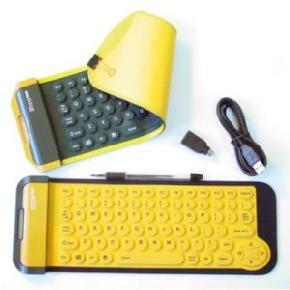 Simply attach the washable keyboard to your USB drive and sink your keyboard! 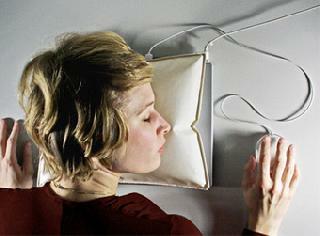 Laptop pillow – need to sleep? Don't have a pillow with you? And don't want to keep an eye on your laptop all the time? I-sleep laptop airbag can help you. As soon as you close your laptop, the laptop fan automatically fills up your pillow with warm air. Good night. 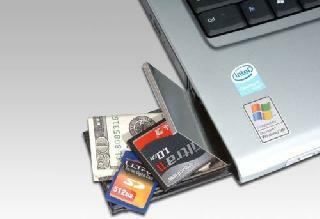 StashCard - StashCard is a small drawer under your laptop. Put money, letters, credit cards under it. So when you lose your laptop, you'll lose everything. No, that wasn't it. But something like it. Wi-fi locator/finder – Traveling around and opening up your laptop to see if there are any free wireless networks around is tiring. Instead, use WiFi Finder. A WiFi finder lets you check for the presence of 802.11b wireless networks and their signal strengths. Many of these accessories are about the size of a credit cards, just a bit fatter. Portable video projector weighs just 3-5 lbs and you can use it to watch movies or make presentation to dozens of people. Keyboard Vacuum – laptop keyboards and the space under the buttons tends to collect all types of dust under them. The answer is a vacuum cleaner for keyboards. I'm sure someone has already figured out a way to power it with the laptop USB device.